Back to the OPI Designer Series today! I am sorry that they are out of sequence but they don't always match well that way. Sapphire is a lovely light blue with a slight pink shimmer. 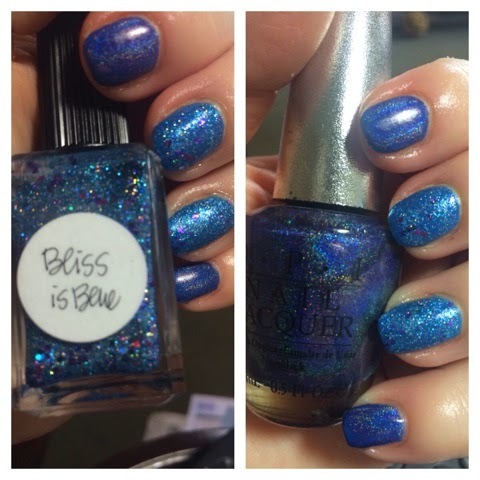 It is a thin holographic polish but applies well, no bald spots or dragging. It does take a while to dry properly and is prone to dinting for some time after application. Elegance is a mid pink with no discernable shimmer. 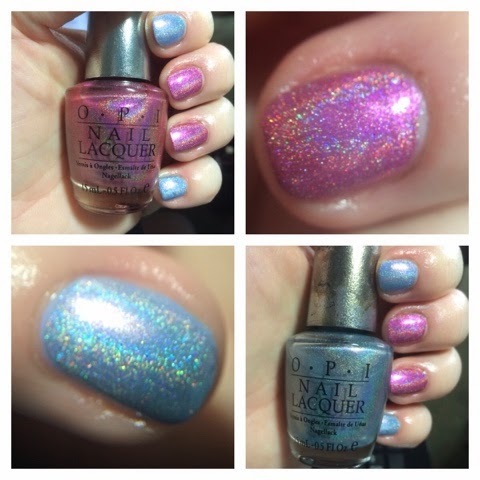 It is a thick holographic polish and applies well and seems to dry normally. 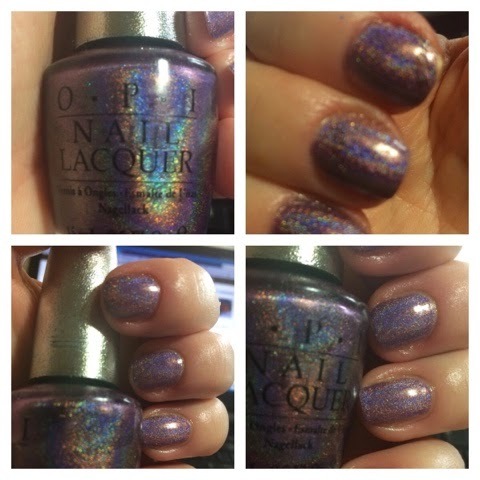 This is much closer to what we see as holo polish in 2015 from Indie makers, it isn't quite as stinky as some OPI holographic polish and the formula is good. Both polishes are painted over a base that is close to the DS in colour. I do this simply to save building up several coats of what are now discontinued polishes. The blue base is a Nails Inc called InStyle Bluebell, a light blue cream and the base used for the pink nails is OPI Just Lanai-ing Around and it is from the Hawaiian collection so should be easy to find. 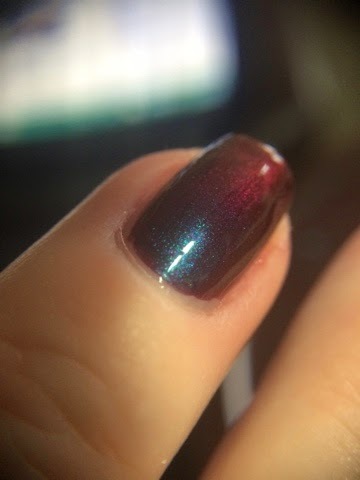 Close ups show the strong holographic effect and a little of the pink shimmer in Sapphire. The base colour hasn't changed how this looks; I have used it on its own a few times and it does build to this shade in 2-3 coats. No top coat has been used in these pictures. These DS polishes are long discontinued and if you want either, you will have to look on eBay or Facebook sale pages. They do pop up from time to time. If you are reading, then I'd love your comments, feedback is always appreciated. I am not a nail technician or a photographer! I do not claim to have fantastic nails. I simply own some fabulous polishes and have some fabulous friends who help me find them! More in the DS series today (does that make sense? Designer Series series?) - with the dusty blue that is Glamour. At number 18 it is a latecomer to the series and seems it should belong with the earlier linear holographic polishes such as Original etc. I have used my Lynnderella custom, Bliss is Blue, as an accent. 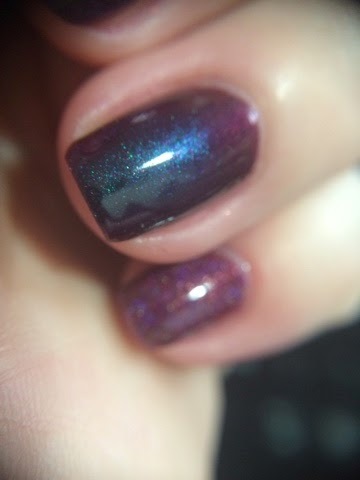 As you can see the OPI is a lovely dark mid blue linear holographic polish, having an almost faded denim look to it. It is painted over a royal blue gel that you can see peeps of at the edges. The colour is fairly accurate, I saved a few coats of the precious OPI by using a base. The OPI applies well, has a fluid texture and dries fast. It is quite stinky too. I love the colour and although I have some dupes (Ninja Glamorous for instance) nothing beats the original. As for my custom Lynnderella, it is a bright blue with purple and magenta accent glitters. There is a dash of holographic spark in the mix. This DS polishe is long discontinued and if you want it, you will have to look on eBay or Facebook sale pages. It does pop up from time to time. My Lynnderella custom was made to order and you would need to contact them to enquire whether custom orders are being taken. DS Diamond is one of the last linear holographic polishes in the Designer Series. It is an unusual colour, sort of grey, sort of lilac, sort of light brown, sort of silver! It was one of the 4 I bought brand new in 2006/7 and I was impressed at the time. I still am! The product has discoloured in the bottle but this doesn't seem to have affected the quality so far. I am not sure what has caused this to happen. Application is great, it is smooth and doesn't have any problems with dragging. It was longer than average in dry time and did dint a little later. 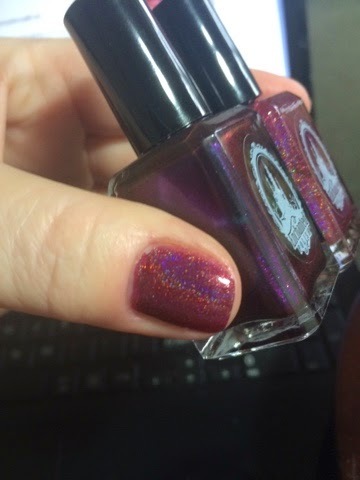 I have not used topcoat, it is this shiny out of the bottle. Maybe dry time would have been improved if I had used topcoat. This doesn't have the same stinky smell as the earlier DS polishes but is stronger smelling than other OPI polishes. So I guess this was made as they were reformulating their products. 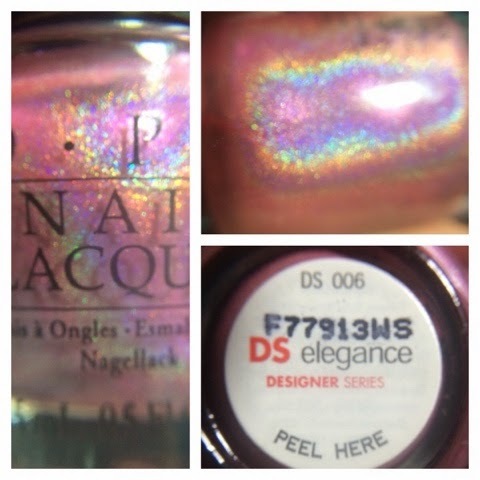 Some DS polishes are still available from retail sellers of OPI but most are long discontinued and will have to be found in eBay or Facebook sale pages. 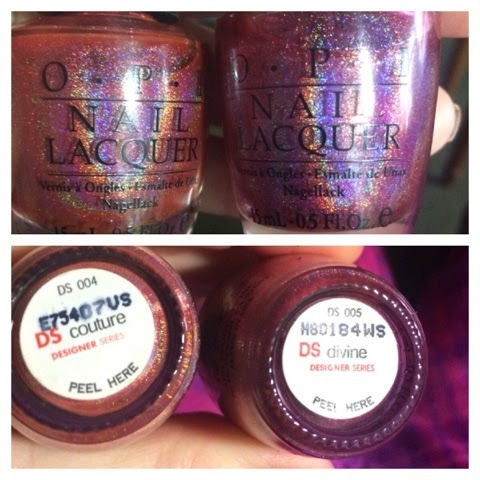 More from the OPI DS Collection today, DS Couture and DS Divine. 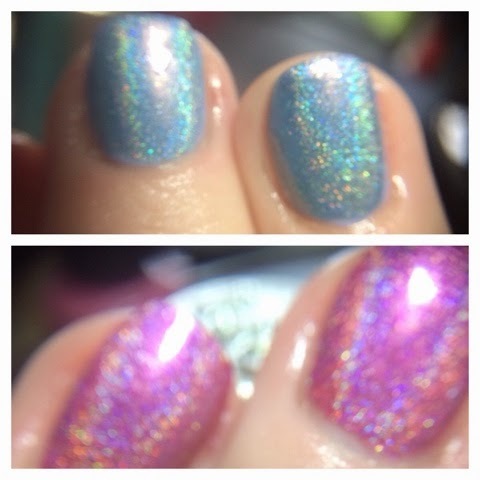 Both are slightly stinky but beautiful linear holographic polishes. It is a shame that these are consecutive numbers as they are quite similar; one falls on the orange side of the pink line and the other is definitely on the pink side! Couture is fairly fluid and paints well. It is an orange toned pink (or a pink toned orange...) and it has a lovely flame. I found it dried quickly. Divine is a thicker polish and is more tricky to apply as the second coat seemed to drag a little. It took longer to dry and was susceptible to dinting for some time after. As you can see from the picture below, the polishes are close in colour and a passing non nail person might not notice I had two different colours on my hand. The difference between the two is more noticeable in natural daylight; under lamp light the colours seem close. 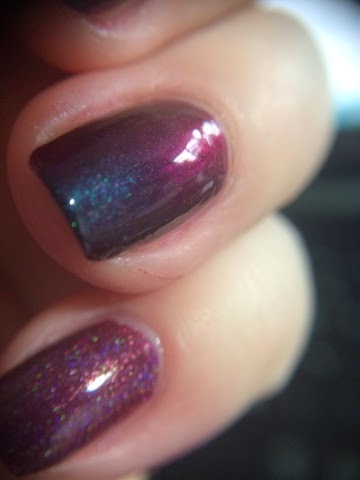 Close ups of both colours shows the holo effect and that the shades are quite different. 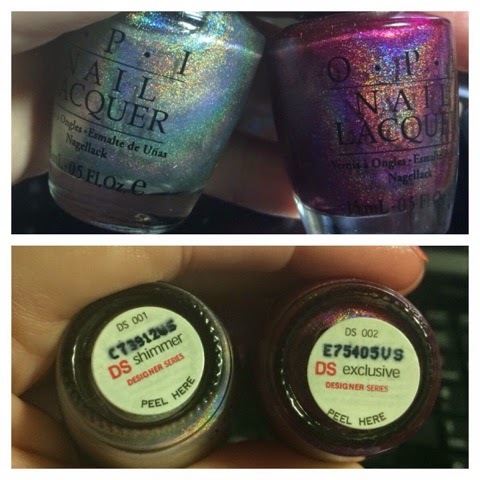 Some DS polishes are still available from retail sellers of OPI but the two shown here are long discontinued and will have to be found in eBay or Facebook sale pages. This might contain a spoiler for anyone receiving a box from Down Under during February 2015... so if this is you and you do not want to see what is in the box, please do not go any further. 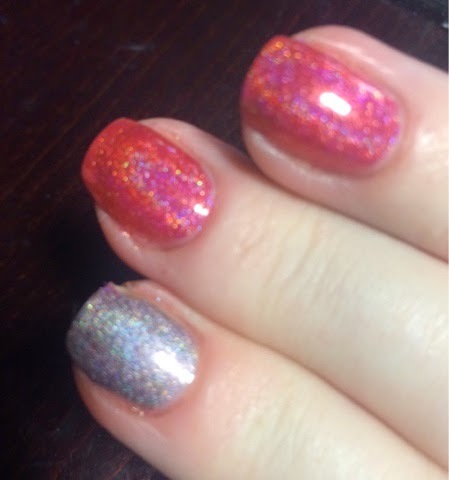 I am lucky enough to have all of the regular OPI Designer Series polishes. 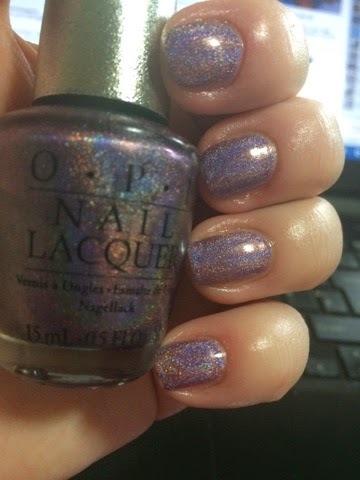 There are just under 50 and they have been available for around ten years with OPI releasing a few new ones every year. There are a few that were released into the Japanese market. I do not have any of these. 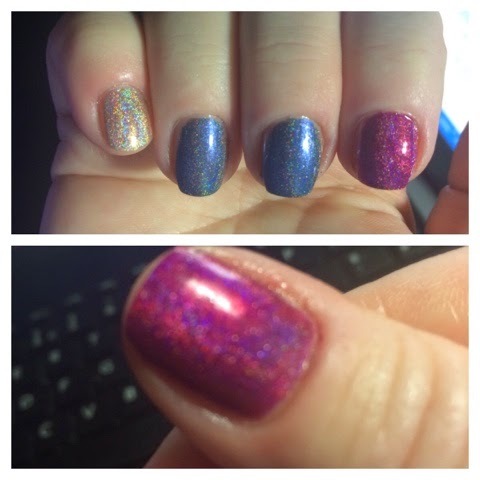 The first few were stunning linear holographic polishes. They have ventured into shimmers, duo chromes, scattered holos, liquid sands and matte along the way. I think it is fair to say the earlier ones are the most sought after and are possibly the most beautiful. I recall gazing at DS Amethyst and Sapphire in wonder at all the rainbow colours. This was 2006-7 and I wasn't really into polish at that time. I have bought some brand new and many from private sales on eBay or Amazon. Some were gifts from friends. Most were reasonably priced; one or two were rather more expensive but none were super silly priced. I have seen some on eBay recently for very high prices. 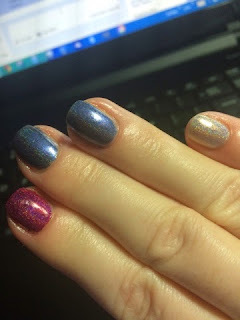 I love these polishes and even the later ones have something about them. With holos becoming almost ubiquitous from the Indies, maybe the DS are no longer as unique as they were. They were, at the time, very different and to me, very special. The only gripe I have is that the silver lids (that distinguish them from normal OPI polishes) tend to tarnish over time. They were sold in boxes at one point. The blue polish on my middle fingers is Enchanted Polish, Bruised Nutcracker. It isn't part of this OPI series but was just there asking to be used. 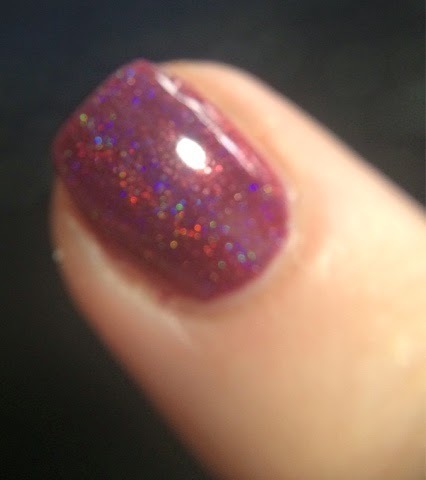 OPI DS Shimmer (001) is shown on my little finger. 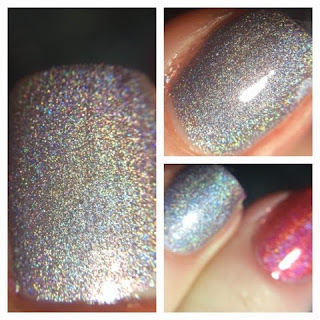 It is a white-ish holo with some golden tone to it and needs two or three coats for full coverage. It dries quickly. 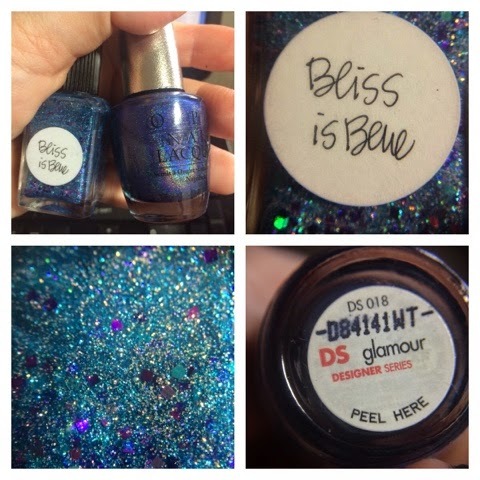 The earlier DS polishes are not 3 free and this means that they are a bit on the stinky side. They have that strong nail polish smell; not as bad as Kleancolor by any means but they have a distinctive smell. 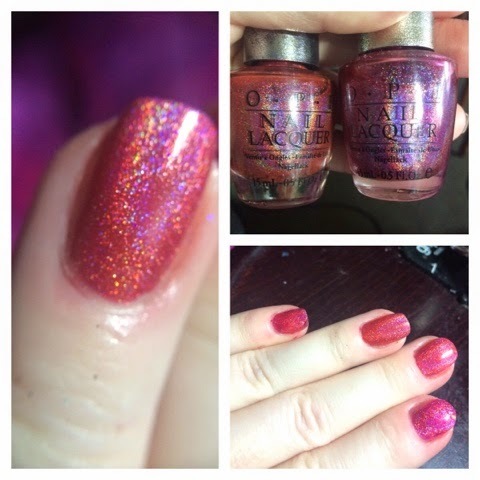 OPI DS Exclusive (002) is possibly my favourite, it is a rich magenta and it has a thicker formula than most of the early DS polishes. This is two coats. I have used OPI DS Topcoat to finish off. It seems thicker than other OPI topcoats and reminds me of Seche Vite. It seems to dry reasonably quickly and gives a high gloss finish. 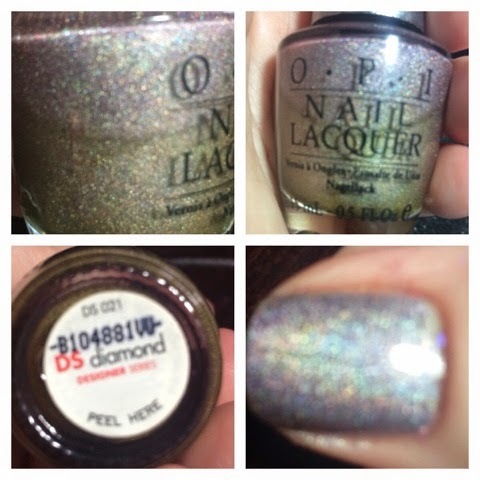 The polish below is OPI DS Original (003). It is a dusky violet and I am sure it is what some experts would describe as a brown leaning violet. This is three coats; it is quite sheer to start with but builds up well. I might have, accidentally, acquired three of this one! So pretty it deserves its own picture! 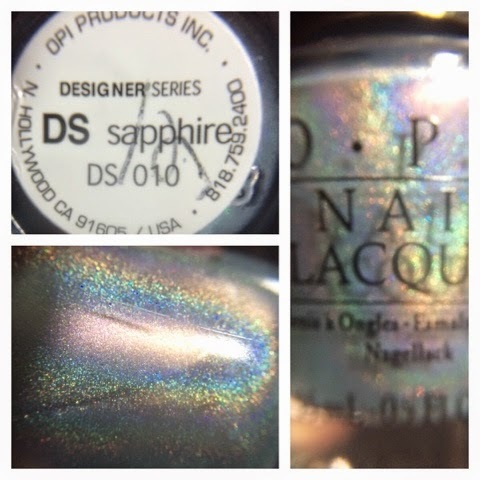 Some DS polishes are still available from retail sellers of OPI but most are long discontinued and will have to be found in eBay or Facebook sale pages. It took me about a year to complete my collection once I decided to do so. Many came from the USA so postage is another thing to factor into buying. Two lovely polishes from Enchanted Polish, 2AM Summer Night and Mr Burgundy. I have had both of these for some time. 2AM was a surprise launch in 2014 and Mr Burgundy was sometime in 2013. 2AM is a multi chrome polish with no holographic pigment. It moves through burgundy to red to navy blue and each shift is strong. The application is a bit tricky; I found it thicker than usual and the second coat did drag over the first coat. Maybe a drop of thinners might help. 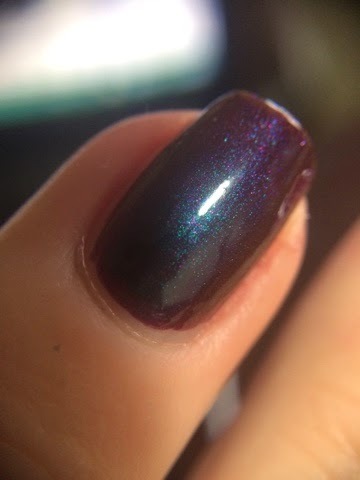 Mr Burgundy is a perfect holographic polish. I had no issues here, two perfect thin coats. 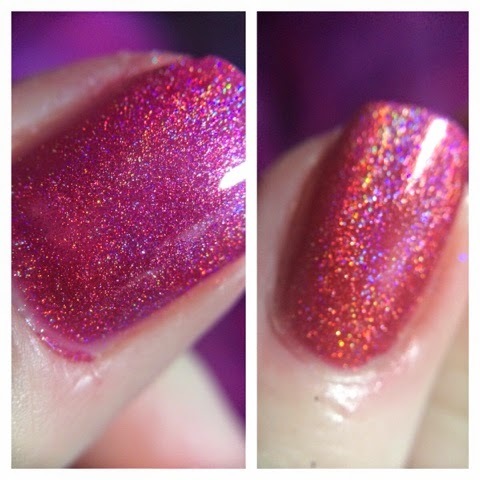 It isn't a raging holo polish with a screaming rainbow of holo flame. It is more grown up than that. There is a definite effect with a blue inner flame but this would be suitable for any occasion. Both polishes have a coat of Out the Door fast drying topcoat. I prefer this over Seche Vite for non glitter polishes. It is thinner than SV and does the job. Look at the range of shades in 2AM! Red, magenta, blue! 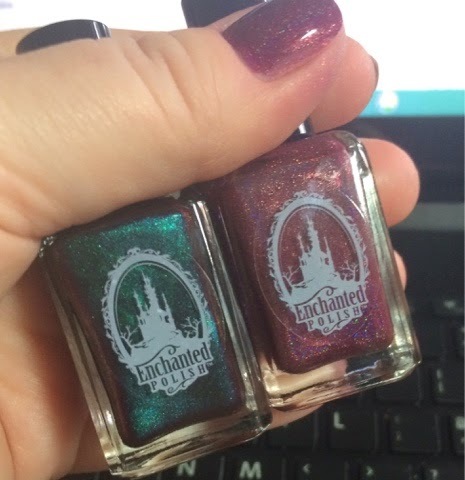 Both polishes are no longer available from Enchanted Polish but you might find she restocks on one of her surprise flash restocks or they might appear in a stockist. There is little public announcement with EP.